To celebrate the launch of our Android App, we are giving away an Android Smartphone. Win a Sony Xperia smartphone with VoucherPages.ie, Ireland’s leading coupon provider. To enter, simply download one of our mobile apps. Competition closes May 30th, 2014. A push notification will be sent out via App with a competition code. Caller number 10 wins the smartphone! See full details. Update on 30/05/2014 – Competition now closed caller number ten to (01)9010448 with code VoucherPages wins the smartphone! Prize is a Sony Xperia Smartphone. Competition closes 30th May 2014 at 11.59am. To enter, download one of VoucherPages smartphone apps and be caller 10 when we send out a push notification with the competition code. Standard operator land line call costs apply. Open to Republic of Ireland residents with an address in Republic of Ireland only. Winner must provide Republic of Ireland delivery address. Contact details are used for purposes of sending prize to winner. 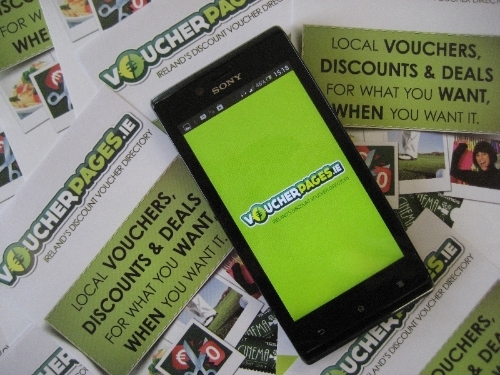 By entering competition, you agree to subscribe for VoucherPages.ie voucher email alerts. Competition Promoter is Voucher Pages Limited. By accepting prize, winner agrees to have name used for publicity purposes. Prizes will be forfeited if contact cannot be made with the winner within 3 days of the competition end date. Entrants must be 18 years or older. Winners of any prize draw must be 18 years of age or older to claim prizes.